Manchester City manager Manuel Pellegrini refused to blame officials for his side's loss to Spurs. MANCHESTER CITY MANAGER Manuel Pellegrini refused to blame the match officials after the Premier League’s early-season pace-setters crashed to a 4-1 defeat at Tottenham Hotspur on Saturday. Spurs came from behind to inflict a third defeat on City in four matches, with Eric Dier, Toby Alderweireld, Harry Kane and Erik Lamela finding the net after Kevin De Bruyne had put the visitors in front. Kyle Walker was clearly offside in the build-up to Dier’s equaliser and Kane also appeared to have strayed offside when he struck, but Pellegrini said his side’s defending had also been at fault. “My mentality is not to have excuses,” the Chilean told his post-match press conference at White Hart Lane. “Important goals, maybe the two goals were very important. One was the draw, the other was for 3-1, and it is more difficult to be 3-1 than it is to be 2-1. Dier’s goal, in the 45th minute, saw him drill home from 25 yards after City goalkeeper Willy Caballero, deputising for the injured Joe Hart, had blocked from Son Heung-Min. Son was set up by Walker, who had strayed at least two yards offside before crossing from the right, but Pellegrini felt that his side should have made a better job of clearing the ball. 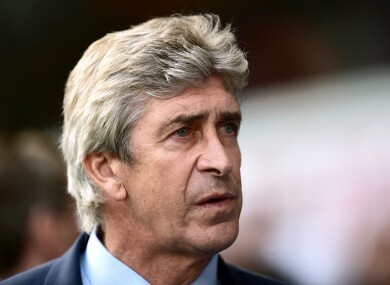 “I think that was a clear offside, it was maybe a matter for the linesman,” said Pellegrini, who had seen his side lose 2-1 at home to West Ham United in their previous league outing. Spurs manager Mauricio Pochettino, whose side had lost 2-1 to bitter rivals Arsenal in the League Cup in mid-week, was also eager to downplay the significance of the officiating errors. “You know football, sometimes it goes for you and sometimes against you. We need to keep calm because the decision is for the referee,” he told BT Sport. Email “Pellegrini gives admirable response when asked about decisions going against his side”. Feedback on “Pellegrini gives admirable response when asked about decisions going against his side”.